Spend less time waiting by the wall outlet with the Powwer 10,000mAh Portable Power Pack from iJOY. This battery pack can charge two USB devices at the same time and has a capacity of 10,000mAh, enough to fully recharge most smartphones up to three times. One of the ports delivers 2.1A of power for faster charging while the other one provides only 1A. When it's empty, plug it into your PC or wall charger to recharge it. 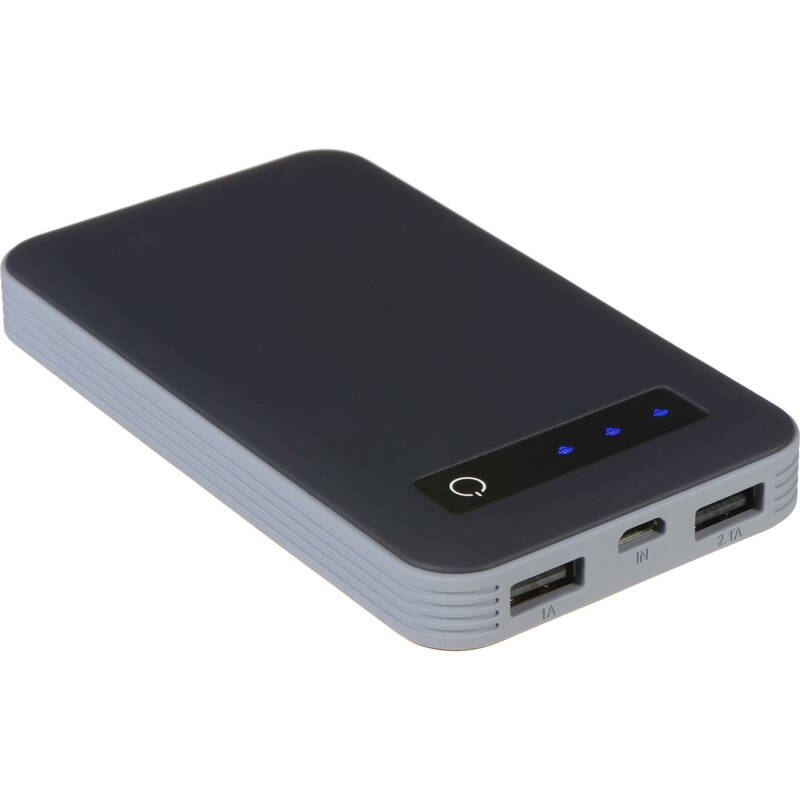 Box Dimensions (LxWxH) 6.9 x 3.9 x 1.1"
Powwer 10K 10,000mAh Portable Power Pack (Gray) is rated 4.4 out of 5 by 16. Rated 5 out of 5 by Anonymous from THE BEST POWER BANK i have 2 of these & i would be lost without them. i use one and it charges my zenfone 2 laser,3 times or more ,i really didn't count yet at least 3 times. fast with the fast charge,my tablet at least 2-3 times, also other devices all with 10000 mAh. my friends also use it, because i always have one with me. at this price it is a steal. great quality,no cons. great brand. get them while they are in stock! Rated 5 out of 5 by Anonymous from Works great, was able to charge my phone twice with this Works as expected. Useful two USB charging ports. One is really fast, managed to charge my S5 really quickly. Second time, I thought just to drain it completely before recharging it, but managed to recharge the phone again to full capacity. Rated 5 out of 5 by Nelson from Great Portable Battery Charger This portable battery charger is great. It lasts a long time between charges, and fully charges a phone quick. Rated 5 out of 5 by Arnaldo P. from Great price for a great battery charger This battery charger offers one full charge to all my family's mobile devices (2 iphones and 1 ipad) while we are on the go. Rated 5 out of 5 by Louie Mamiya from Limited Lifetime Warranty for power bank!!!!! Great products! All my family members and friends have one! LOVE it! Rated 5 out of 5 by DP from Great buy I am using this to recharge my phone during a long vacation. The battery comes with 2 USB ports, 1A and 2.1A. Most smartphones would come with a 1A usb wall charger. If you use the 2.1A port of this device, it would just charge twice as fast than your usb wall charger. The iJOY 10000mAh Power 10K Power Bank is compatible with any device that charges with a USB cable, including the Samsung Note 4. Does this sense and supply the necessary voltage for the device or simply push 5 volts at it? It doesn't push, the device you connect pulls the needed voltage. It has a fast charging 2.1A port, and it can charger your phone pretty fast ( under 2 hours). Of course, it also depends on the capacity of the battery in your phone. Does this come with a charger for charging the power bank? No, it only comes with a small cable which you can connect to any android charger, or use an android charger's cable directly.